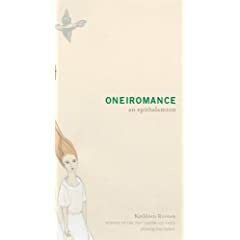 The 2007 winner of the Gatewood Prize, Kathleen Rooney's Oneiromance (an epithalamion) is powerful poetry, one epic poem that explores all the emotions of a wedding with truly unique and cutting wordplay. ""Kathleen Rooney's beautifully structured epithalamion is saturated with nuptial terror: the music and friction, zeal and unease, absurdity and profundity of marriage." I know, I know—but hear me out. This song was one of the most successful singles of 2002, and probably got that way because it is both really cornball and silly and really touching and wonderful, which, I would argue, are qualities it shares with weddings. Weddings are phenomena that in some sense reduce people as individuals, but enrich them together; they encourage people to let themselves go (the album this song is from is called Let Go, incidentally) and give themselves over to something bigger and more social. Bread and circuses! Weddings are often enormous circuses in and of themselves, or at least ours was. Again, here I’m interested in the idea of spectacle, and in people’s willingness to choose fun and feasting, often at the expense of individual freedom or expression. Also? I love Brazilian music, and Os Mutantes make some of the best. I’m not religious anymore, but this song is a moving expression of religious longing. I’m chained to your side. I also am a fan of this part: “And before this gets old, / will it still feel the same? / There’s no way this will die,” as well as of the tension between the ridiculous and the heartfelt that permeates the whole song, and, of course, the distant whistling near the end. Of additional relevance is that it’s a spousal collaboration between Benatar and her second husband, Neil Giraldo, who co-produced. Once we all got back to the States, our respective parents threw us a huge party at the American Legion Hall in Downers Grove, Illinois, and the DJ played this song while we were all sitting in a row up at the head table looking out at the crowd, and it was just like yeah, love is a battlefield. This one’s in the book too, pretty extensively in the poem “Midwestern Groom: Dream no. 4.” For the aforementioned party, we had to do all the usual reception-y things like introducing our parents and honoring our grandparents and doing a “first dance,” and we—Martin, Nick, Beth and me—had to pick a song off the DJ’s playlist that would manage to express in general terms our unique loves for one another, thereby holding personal significance for us while simultaneously telegraphing said love to the 300 or so assembled guests. So we picked this one. “And you love me ’til my heart stops / Love me ’til I’m dead?” Yes. This song wasn’t out at the time we got married, but we really admire The National and listen to them all the time. We had them in especially heavy rotation when we were living in Provincetown in 2005–2006, which is when I wrote much of Oneiromance, and where Martin, who was a fiction fellow at the Fine Arts Work Center, wrote much of his novel. Martin and Nick and Beth and I heard this song together most recently when we were standing in Grant Park on November 4th, 2008, along with hundreds of thousands of other supporters waiting to hear Barack Obama’s speech upon being elected the next President of the United States. Before he spoke, the JumboTron played a video about hope and change in which this song figured prominently, and it made me cry for the first time that night. So that will be the last track on the Oneiromance soundtrack, I think, because it circles back to the individual-social axis I referred to with the first one, and the way that spectacles and the music that features in them can help unite us and elevate us as a group. This song—or at least, that particular experience of hearing it in the context of being with Martin and Nick and Beth and all those other people at the election rally—illustrated that effect in reverse: we were losing ourselves in this huge, historic, communal moment, but then suddenly—by hearing this song to which the four of us felt a personal connection played to the crowd—we were finding something of individual significance. “Turn the light out, say goodnight / no thinking for a little while / Let’s not try to figure out everything at once”: after so many of us had worked so long for the candidate we believed in, the song was perfect for the way it felt to finally know that somebody would soon be in charge who has our best interests at heart, and who has got the situation under control. Like at last we were hearing: you can stop worrying and rest for a second. We’re all going to work together to fix this stuff and it’s going to be okay.